I had always dreamed of working in an orphanage overseas. It was on my bucket list and when I was 19, I went on my first trip overseas to Romania. I remember being really excited to go! I thought it was going to be so fun to play and work with the kids for a few weeks. I thought I had a fairly reasonable understanding of what to expect. Although I had never travelled outside of North America, I had seen the World Vision commercials and had watched a few documentaries about poverty. I wasn’t completely unaware of the hurting and need in other parts or the world…or so I thought. When we stepped inside the first State run orphanage the indescribable stench hit me like a slap in the face. It was dingy, dark and run down. My excitement quickly turned to apprehension. This was not exactly what I had imagined. As we walked toward the nursery I was curious to see what grandiose and heroic task they would give us to change the children’s lives! We followed the orphanage staff worker down a dimly lit hallway. As the flourescent lights flickered, she informed us that we would start our work in the nursery. I was feeling claustrophobic as my eyes scanned the grimy, paint chipped walls. I was trying to breathe through my mouth as my stomach churned from the unpleasant smell of the place. What WAS that smell? We finally arrived at the last door at the end of the hallway. The staff lady opened the door and we walked into the nursery. 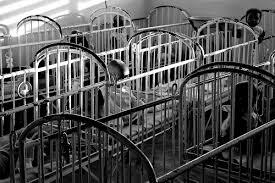 The room was lined with what looked like 20 grey metal cribs. The cribs were lined up side by side and back to back. There was a small narrow path in between the rows of cribs with just enough room for you to sidestep around them. It looked like something I had seen at a chicken farm once. There was not a bright colour, toy or stuffed animal in sight. Each crib had a baby in it, some had two babies in them. I was stunned. This was unnatural. There were so many babies just lying in cribs, all alone. The room was eerily quiet. In a room with 20 or so babies, I expected to hear crying. I asked the worker why it was so quiet in the room. She responded, “The babies learn quickly that there is no point to crying…no one is coming. They just give up”. I was in way over my head. I was sure I could actually physically feel my heart breaking. The staff lady began to explain that they needed us to feed all of the babies. She said that there were so many babies and so few workers that the babies were rarely held or touched. These children lay alone in their cribs all day. She then showed us the feeding system they used for the babies; There was a long piece of milk stained cloth tied to the side of each crib. She showed us how they would fasten the bottle to the piece of cloth and then slide the baby’s head under the bottle. The system reminded me of the water bottle attached to my hamster cage when I was a child. She explained that what the babies needed the most, was for us to pick them up and hold them as they drank their bottles. Some of the babies would go days without being held. She gave us a bin of prepared bottles and left the 6 of us in the room. It felt as if my feet were glued to the floor. How do you choose which baby you will hold? I walked over to the first crib, reached in and picked up the precious bundle. The baby immediately grabbed onto my shirt with both hands. Tears poured down my cheeks as I gently rocked the baby looking into his big blue eyes. His eyes looked dark and desperate- as soon as we locked eyes, he didn’t look away once. He was saying so much, without actually saying anything at all. “I love you” I whispered over and over. When he finished his bottle I felt torn. I didn’t want to put him down, but I could see the sweet baby in the next crib looking longingly at me. I bent over the crib and tried to gently lay him down. His grip on my shirt tightened. He wouldn’t let go. I cried harder as I gently pried his little fingers from my shirt. I felt horrible. I stepped over to the next crib and reached in. This baby immediately grabbed me as well. My hands were trembling. I was desperately trying to maintain my composure. I shakily raised the bottle to her mouth and began rocking her back and forth whispering the same message to her: “I love you”. We went from crib to crib, picking up and rocking each baby until all of the babies had been fed. When we were finished, we climbed into the taxis that were outside waiting for us. I slumped in my seat, put my head in my lap, and cried the whole way back to the place we were staying. It had not been the exhilarating, rewarding experience I had expected. It was absolutely devastating- the worst thing I had ever experienced. The reality of my privileged, sheltered upbringing confronted me like a megaphone. I was changed that day. I have never seen the world the same way since. Let’s commit to sticking to our goals to be healthy body AND spirit this year! Thank you for writing this. I held on to every word until the very end. I haven’t read an article with such intrigue like this in a long time. My dream is also to work with orphans. This is the truth of how it really is and what an enormous need there is for our help. Merry Christmas! As I read this, I felt I was reliving the exact experience I had when I was 19 and also volunteered at an orphanage in Romania. You described it so accurately and I feel your pain. Thanks for posting. …tears rolled down my face reading this…I had the same experience 3 times in Romania…thanks for the reminder that this time of year isn’t about “us”…God bless you. This brought me back to the day I went to an orphanage in Vietnam when I was 17 years old. Same scene, rows of cribs in a room and too many babies for the limited staff to get to. Many of them going days without being held. Everyone one of us picked up a baby. They were stiff like wood slabs, not used to human touch. I was taught to say “I love you” in Vietnamese and repeated this over and over. Everyone in our group was sobbing as we held these precious bundles and it was devastating to put these babies back in their cribs and walk away. I just finished reading “The Boy From Baby House # 10” , the true story of a boy who grew up in a Russian orphanage and mental assylum before getting adopted at 10 years old. I highly recommend this story to open our eyes to what is happening to children around the world. Heartbreaking and beautiful. Why oh why is adoption so expensive and difficult? Makes me want to open my home to so many babies and give them a loving home and family! Be blessed this Christmas. I haven’t cried this hard in a long time. It was brave of you to relive your experience and share it with us. Thank you for giving me a new perspective. Blessings!